Ryan Gosling easily is one of the most stylish men in Hollywood . 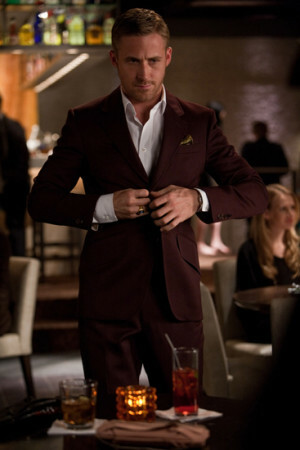 Everyone is talking about his dapper and sleek style in the movie ‘Crazy, stupid, love’. Style trivia: His character in the movie underwent 36 wardrobe changes ! 1. It is all about the fit. 2. If the fit is right for your body shape, you will be able to create clean lines and a sharp silhouette. 3. Details at the collars and details at the cuffs. Keep the look classic, yet introduce an interesting detail that makes it trendy. What did Ryan wear in this popular scene? 2. Suits, with hand stitched leather details, quality that will last for atleast 10 years(worth the price tag) designed for him by Albert Hammond Jr.